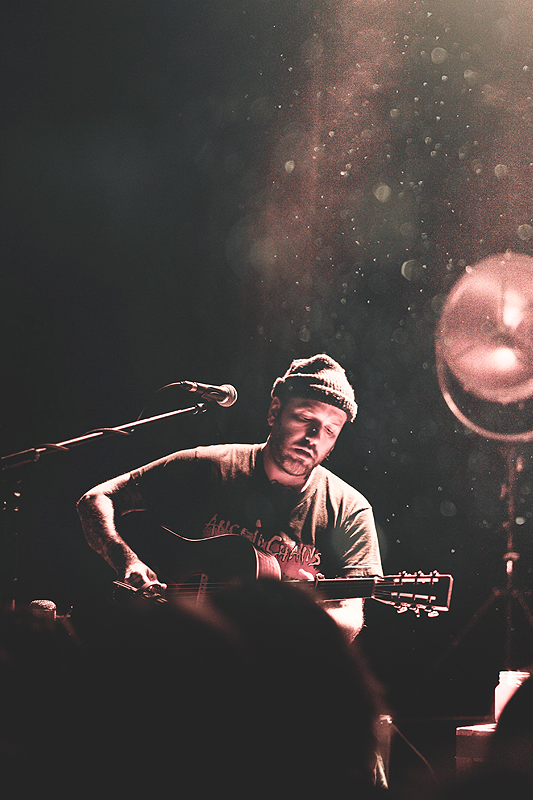 There's a line that I'm trying to find, between the water and the open sky," sings Dallas Green on "Friends," the penultimate track off of his fifth release as City and Colour, If I Should Go Before You. For someone like Green, it's hard to imagine that there's much left to search for – he's traversed the globe on tour, released numerous albums (one most recently as You+Me with Alecia Moore, aka P!nk) and collected scores of accolades. Though Green is a musician, he doesn't make a show of things: that's the songs' job. Thus he's done this all quietly, intentionally, still looking for the next answer or dog-eared chapter each record holds. And this time, on If I Should Go Before You, he once again uncovered something new: a certain kind of family in his bandmates. "It's been a very special two years for me," says Green, about the period since the release of 2013's The Hurry and the Harm, which has seen him touring with the consistent ensemble of Dante Schwebel (guitar: Dan Auerbach, Rumba Shaker), Doug MacGregor (drums: Constantines), Jack Lawrence (bass: The Raconteurs, Dead Weather) and multi-instrumentalist Matt Kelly. "They inspired me to want to create new music, just to create it with them – I don't think I wrote these songs for the band, per se, but I certainly wrote them because of the band." Green had always been an introspective, solitary writer, demoing songs in his basement, working up every instrumental part by himself. But he considers If I Should Go Before You to be a band record, where the input of these trusted comrades was of the upmost importance. Even more pivotal was trying to capture the essence of their live show symbiosis in the studio; which comes through with an undeniable force. For a project that was very much about the inner world of Green, these relationships have morphed City and Colour into something with more emotive power than ever before: the layers go beyond just music and lyrics, into the people creating the songs themselves. "Anybody who has seen us play will understand that this is the best representation of what we do live that we have ever recorded," says Green. "I was so excited about being able to make and record an album with these guys that it just flowed. I felt so confident about their abilities to make all of my ideas come true." But there was one thing that Green did want to do himself this time: produce the record. He returned to Blackbird Studios in Nashville, where The Hurry and the Harm was made, but decided to take the production reigns himself, with the help of friend Karl Bareham as his partner and engineer, along with the masterful mixing skills of Jaquire King (Dawes, Kings of Leon, Tom Waits). Everyone who had a hand in the making of the record was or became part of the City and Colour family. Green's songs have always had a striking, visceral feel that pumps through the veins like oxygen, and, this time, it became a sort of translatable DNA. Along the way, Nashville has come to be a special refuge for Green – it's a city he's gotten to know for several years now while not in his native Toronto, Canada, and he even recently purchased a home in the town. "In Toronto, I think of what I have to do," he says. "In Nashville, I think of everything I have done." Indeed, it's a perfect time to think of everything he has done - and If I Should Go Before You is a celebration of that. With instrumentation recorded live off the floor, it comprises every part of the person Green has become over the years: chugging ballads that tug at the gut, aching confessionals set to slicing guitars, little licks of pedal steel for his new southern-swept soul, moody distortion from punk rock roots. Though he's recorded in many incarnations, If I Should Go Before You acts like a roadmap through all of them, showing that none of these were simply "projects," but they were part of the same whole. The album opens with the sweeping, "Woman," a track that very well could be a surprise to those who might expect a simpler, acoustic-based entrance gate. At over nine minutes long, it's a sultry and dynamic ode to everlasting love expressed through a powerful, layered build of sounds and emotions like a complex sweep of watercolors – a percussive heartbeat, echoing riffs, Green's grounded yet ethereal falsetto. You can almost picture the stage lights spiral across a crowded auditorium; it moves with a life outside just the studio walls. Rare does a record strike a perfect balance between the live sound and studio magic; but this is one of them, that captures the synchronicity of Green and the band at its best both at the controls and on stage, through songs like the deconstructed waltz of the title track, a devastating request to a cherished lover. "It's about the idea of loving someone so much you want them to move on if you were to go, but loving them so much you wouldn't want to if they did," Green says. "But, in my head, it also says, 'if I were to go, I give you this record to listen to.'" It's a sentiment that expresses just how strongly he feels this album is a key to past, present and future. That's further evidenced in "Friends," written as a heartfelt ode to his new musical family, set to a pedal steel that sounds like it’s weathered too many winters, but finally feeling the melt; or the razor cuts of "Wasted Love," where the confessions of a failed romance are echoed by licks of visceral guitar that plays in wordless response. Green began recording as City and Colour in 2005, with Sometimes, followed by 2008’s Bring Me Your Love and 2011’s Little Hell, and has experienced huge success both on the charts and the road. All four previous studio albums have achieved platinum status in Canada, while Little Hell is also now Gold in Australia. The Hurry and the Harm debuted at #16 in the USA on the Billboard chart, # 1 on Canada’s Top 200 Chart and #4 in Australia, as City and Colour's highest debut. He also released four records as part of Alexisonfire, which have all received Gold and Platinum certification in Canada, as well as 2014's rose ave. as You+Me with P!nk, which made its entrance at #1 on the Canadian Albums Chart, # 4 in the USA, #2 in Australia and #6 in Germany . On If I Should Go Before You, Green may have found one answer to what lies between the water and that open sky: it's the people we hold close, and the art born out of friendship. But he will always be searching; and thus, there will always be more songs. Though this time, when he's ready to share them again, he'll know exactly who to turn to. As he sings on "Northern Blues," "I've got too much in front of me. I didn't leave enough behind."